For almost a year now, my daughter with ADHD has been suffering from depression. When her doctor diagnosed her with depression, I was shocked and I didn’t know what to say. I was like a deer in headlights. “But she’s six years old,” I said. “How could she have depression?” According to WebMD, 2.5% of children in the US have depression, but in a study done with 125 children with ADHD, 39% of those children had depression. So why is depression much higher with children who have ADHD? Kids with ADHD have it rough. These children are very bright and they have the best intentions, but because of the way their brain is wired, they have a difficult time focusing and they get distracted very easily. That is incredibly frustrating for them. Imagine you’re in first grade and are given a math worksheet to complete in class. You know the material. You know what to do. You are trying your very best to complete the worksheet, but the kid next to you keeps tapping his pencil on his desk, making you look over every time. There is also a thread loose on your sleeve, so you keep pulling it because it’s fun to watch it unravel. There is also a bird outside the window chirping, which makes you imagine what it would be like to have wings and fly. Next thing you know, the teacher says, “Time’s up! Pencils down!” You look down at your paper to discover you’ve only written your name and completed five of the twenty-five math problems. Even though you knew all the answers, you receive a bad grade. Your teacher and parents are dissappointed and regard you as an underachiever while your classmates regard you as dumb. You feel angry, frustrated, disappointed, and irritated with yourself. Now that you understand what it is like to be a child with ADHD (mind you, this was only one example), you can see how ADHD can bring on depression. Since my daughter was four years old, my husband and I suspected that she had ADHD. (My husband has it as well.) I read many books and articles about helping my child with ADHD, I have taken her to behavioral therapy, got her the proper medication, and worked with her school to get her the proper classroom accommodations. Through experience, I have learned tactics to help her with her ADHD and the meltdowns that come along with it. Her ADHD is manageable, but her depression is definitely something I was not prepared for. For the past year, she has had a constant negative outlook on everything. Things that would normally excite a child don’t excite her. We take her to fun places like the park, Chuck E Cheese’s, and Disneyland, but even being at the Happiest Place On Earth doesn’t get rid of the gloomy raincloud constantly hanging over her head. She hates smiling in pictures. I am as positive, loving, and nurturing as I can be around her. She is surrounded and supported by a very large and loving family who want the best for her. Once in a while, I will catch a glimpse of her smiling, but for the most part (and this is very hard for me to admit as her mother), she has been an unhappy and sad child. That all changed when she found Shopkins. If you are unfamiliar with Shopkins, they are tiny adorable grocery/department store figures with cute names, like a lipstick named Lippy Lips, a water bottle named Wally Water, and a cookie named Kooky Cookie. (My daughter’s favorite is a balloon named June Balloon.) She heard about Shopkins from some of her classmates and asked me to buy her some. My daughter really is a great kid and she has been doing very well in school lately, so I bought her a 12 pack from Toys R Us. When we got home, she played with them until it was time for bed. This was about a month ago and every day, it’s been the same. The first thing I noticed was the great big smile on her face when she played with her Shopkins, which is something I hadn’t seen in a while and nearly brought me to tears. Another change I noticed in her was the way she played with them. When she used to play with Barbies, she’d make the dolls act very serious and speak in a boring monotone voice. When I would ask her about it, she’d tell me “That’s because she is a negative girl.” When she plays with her Shopkins however, she makes them sound very happy, cheerful, and (this is the best part) positive! What has really amazed me is she is starting to apply the positive behavior she makes her Shopkins display to real life. For example, instead of arguing with her little sister about what game to play, she lets her little sister pick first. She doesn’t start whining and complaining when I tell her it is time to start her homework. She smiles in pictures. She actually shows emotions and gets excited about things! You should see how her entire face lights up when she simply talks about Shopkins! I have never seen her happier and that fills my heart with so much joy! They say children need our presence, not our presents, but I have found that my child with ADHD needs and deserves both. People might read that and say I am going to turn my child into a spoiled brat, but I disagree. What is wrong with rewarding a wonderful kid with well-deserved presents? My daughter truly does try her best at school and at home and I couldn’t be more proud of her. To treat children with depression, they may undergo Cognitive Behavioral Therapy (CBT) and Interpersonal Therapy (IPT), right? Well, playing with Shopkins just happens to be therapeutic for my child and has helped bring my baby girl back to me and back to life. I am not saying that going out and buying your child Shopkins will cure their depression. 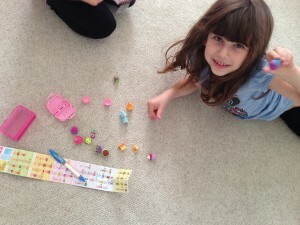 I am simply sharing this story of how Shopkins has made a positive influence in my daughter’s life. 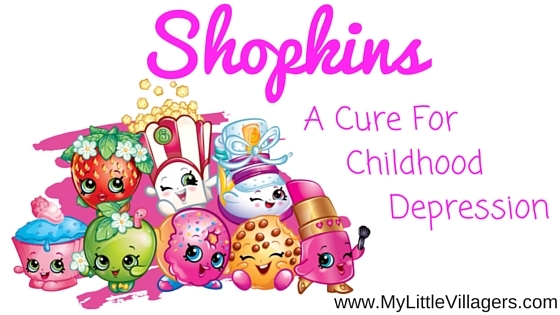 Shopkins or something similar may work for your young child too and I truly hope it does.